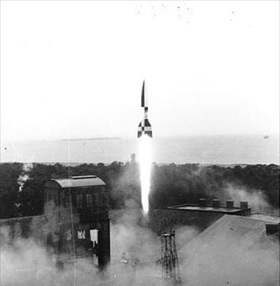 In mid-June 1943 a Royal Air Force reconnais­sance mission flew over the top-secret Peene­muende Army Research Center and V‑2 rocket launch site on the Ger­man Baltic coast. Images con­firmed the pre­sence of long-range bal­listic missiles at the site. A month later British Prime Minister Winston Chur­chill ordered an attack at the ear­liest opportunity based on moon and meteorological conditions. The attack on Peene­muende began Opera­tion Cross­bow, the 22-month-long Anglo-American bombing cam­paign against Germany’s V‑2 program. 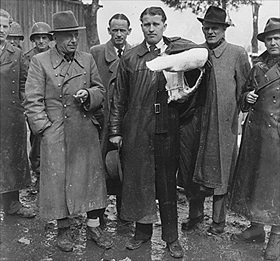 (V‑2 was short for Vergel­tungs­waffe 2; English, “Retaliatory Weapon 2” or “Reprisal Weapon 2.”) Among the Ger­man rocket scien­tists affected by the RAF cam­paign was Dr. Wernher von Braun (1912–1977). Begin­ning at mid­night on this date in 1943 three waves of RAF heavy bombers (596 mostly Lan­casters and Hali­faxes) damaged test rigs and labo­ra­tories (leaving other im­por­tant instal­la­tions un­touched) at a cost of 215 Brit­ish air­crew mem­bers, 40 bombers, and hun­dreds of civil­ians in a nearby con­cen­tra­tion camp. Joseph Goeb­bels, Nazi Minis­ter of Public Enlighten­ment and Pro­pa­ganda, claimed that the RAF attack set the rocket pro­gram back six to eight weeks. V‑2 develop­ment and test firing shifted from Peene­muende to an SS training base near Blizna in a remote area of South­eastern Poland, which was less vulner­able to Allied air raids, while the nearly opera­tional V‑2 pro­duc­tion plant for the most part shifted to gypsum mines in the Harz Moun­tains in East­ern Ger­many. In under­ground tunnels slave laborers from the Mittel­bau-Dora con­cen­tra­tion camp (initially a sub­camp of Buchen­wald) con­structed, by war’s end, 5,200 V‑2 rockets. An esti­mated 20,000 pri­soners died at Mittel­bau-Dora, 9,000 from exhaus­tion. The majority, how­ever, died from dis­ease, star­va­tion, or exe­cu­tion, in­cluding 200 accused of sab­o­tage. (Von Braun admitted visiting the sub­ter­ranean facili­ties on many occasions.) Bodies of V‑2 pro­duc­tion workers were con­veyed to Buchen­wald for burning at the rate of about 1,000 a month. On Septem­ber 8, 1944, the first suc­cess­ful launch of the super­sonic V‑2 missile targeted newly liberated Paris, then Eng­land. From Septem­ber to the following March, Ger­mans launched over 3,000 V‑2s against Allied tar­gets on the con­tin­ent and the Brit­ish Isles. The deadly rockets, falling without warning, killed fewer people than those who died manufacturing them. 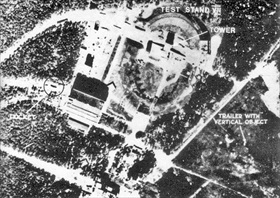 Left: Royal Air Force reconnaissance photograph of V‑2 rockets at Peene­muende Test Stands I and VII, June 12, 1943. The August 17–18, 1943, air raid dropped roughly 1,800 tons of mostly high-ex­plo­sive bombs, which killed two V‑2 rocket scien­tists. Bombs with delay fuses ham­pered sal­vage efforts. The island of Use­dom, where Peene­muende is located, is a tourist destination today. 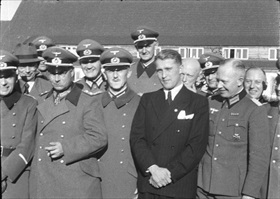 Right: Dr. Wernher von Braun, Technical Director at the Army Rocket Center at Peene­muende, March 21, 1941. The bril­liant pio­neer of modern rocketry (and the father of the Amer­i­can space program), von Braun and his team of engi­neers post­poned their ini­tial dreams of space travel to create wea­pons of terror and mass destruc­tion for Hitler’s Ger­many. Not only were they ambi­tious mem­bers of the Nazi move­ment (von Braun was issued Nazi Party mem­ber­ship num­ber 5,738,692), but they col­lab­o­rated with the SS, the Party’s depraved special police force, in exploiting slave labor to build V‑2 rockets. Left: Peenemuende launch pad with V‑2, March 1942. The ances­tor of modern-day bal­listic mis­siles, the V‑2 (technical name Aggre­gat 4, or A‑4) could not win the war for Germany—it was too expen­sive, too com­plicated, too inaccurate, and its warhead too small. 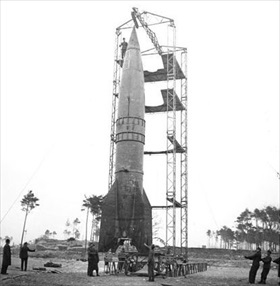 Right: Seconds after a V-2 rocket launch at Peenemuende, March 1942. 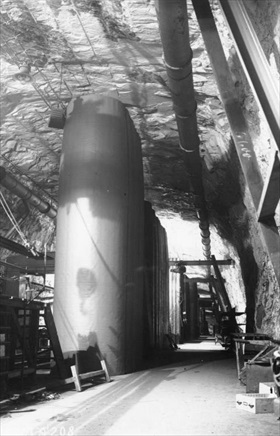 Left: Underground tunnel in the Harz Moun­tains at Kohn­stein where the V‑2 rockets were manu­factured. Photo taken after the Allies had captured the area. Right: The unprecedented invulner­ability and influ­ence on Allied plan­ning made the V‑2 and the advance­ments it repre­sented the ulti­mate war prize, and Amer­i­can, Brit­ish, and Soviet forces scrambled to seize Ger­man rocket tech­no­logy along with its scientists and engi­neers. This photo from May 3, 1945, shows von Braun in an arm cast with several of his scientists shortly after their surrender to U.S. soldiers.